Cherif Kouachi terrorism past: 2005 arrest, 2008 conviction for planning Iraq fighting. Left: Cherif Kouachi. Right: his older brother Saif, about whom little is yet publicly known. Police in France have named 32-year-old Cherif Kouachi as one of two at-large suspects in the shooting attack on Charlie Hebdo offices that has killed at least 12. Kouachi was arrested in January 2005, accused of planning to join jihadists in Iraq. He was said to have fallen under the sway of Farid Benyettou, a young “self-taught preacher” who advocated violence, but had not actually yet traveled to Iraq or committed any acts of terror. Lawyers at the time said he had not received weapons training and “had begun having second thoughts,” going so far as to express “relief” that he’d been apprehended. 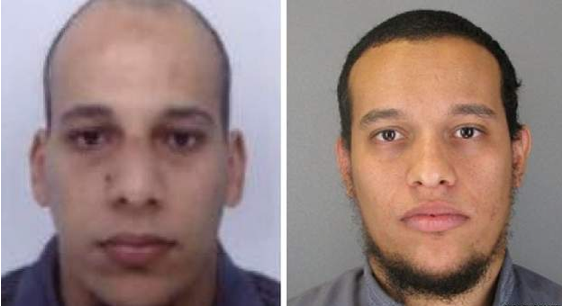 Kouachi, 22, lived his entire life in France and was not particularly religious, Ollivier said. He drank, smoked pot, slept with his girlfriend and delivered pizzas for a living. His parents, Algerian immigrants, are dead. “I think in Mr. Benyettou he found someone who could tell him what to do, like an older brother,” Ollivier said. Ollivier admitted that his client told other militants they should attack Jewish interests in France. But he said that was a front Kouachi put up to look brave. At trial in 2008, Kouachi said that he had been motivated to join a jihadist cause by seeing pictures of American soldiers abusing prisoners at Abu Ghraib. He was tried with six other men, including Benyettou, and lawyers argued that Kouachi and his co-defendants were not terrorists but rather “freedom fighters” motivated to join a foreign war effort by empathy for the suffering of Iraqis. (The attorneys also noted that the French government itself had condemned the American invasion.) The men were nonetheless convicted of “association with wrongdoers with the intention of committing a terrorist act;” Kouachi was sentenced to three years in prison but did not serve any time after conviction because 18 months of his sentence were suspended and he was credited for time spent in pre-trial detention. No reports have of yet included information on where Kouachi has been since 2008, or where he might have received the kind of training that seemed to be evident in Wednesday’s efficient, deadly attack.